After whipping up my last quinoa pilaf, I realized I had forgotten how easy cooking can be. When I’m stressed or simply overloaded with too many extraneous ideas to allow for creativity, cooking turns into an obligatory homework project. From outside the kitchen, it can psychological feel like nothing but a tiresome stack of unwashed dishes. However, cooking’s really no different than when you conquer that first mile of a run. Ten minutes in, and often you’re ready to take on the whole trail. For cooking, this is especially true with one pot dishes like these, where there’s very minimal cleanup required once you hit the homestretch. Simple pilafs like these also keep things light and healthy. There’s no stove full of pans to oil up but rather just one pot of quinoa simmering away. That being said, don’t skimp on the tahini when you finish this one off. 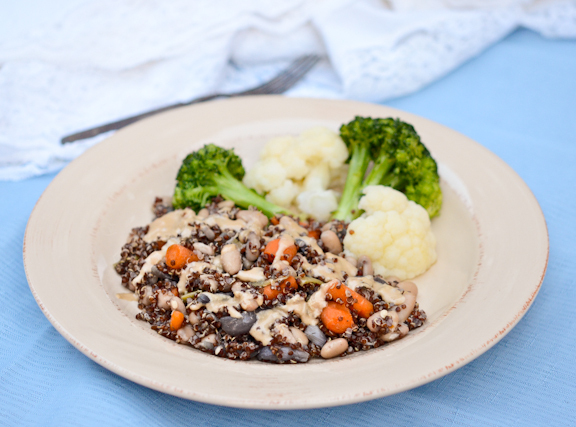 The creamy component is needed and adds a perfect richness that compliments the flavors infused in the quinoa. Enjoy! Place quinoa, carrots, peppers, onions, poultry seasoning and entire contents of can of cannellini beans into pan with 1 cup of water. Bring to a boil. Then, reduce heat to simmer, and cook 30 minutes, or until liquid is absorbed and carrots are tender. Remove from heat. Sprinkle each bowl with salt, and drizzle with 2 Tbsp. tahini. Serve. This looks awesome! 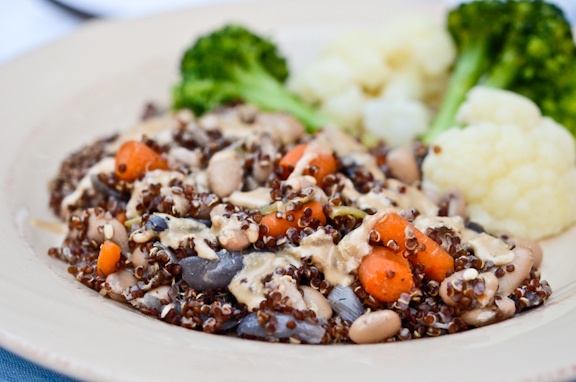 Anything with quinoa and beans has to be good! Saving this recipe because I need ways to use tahini, other than hummus! Thanks!